I actually wore my hair in a mess of scrunchies like that in junior high and they looked ridiculous in my fuzzy curly hair! But I adored this show, Mayim Bialik was one my idols for being able to pull off such daring fashion – I mean a skirt made out of ties? Genius! And I still watch her in The Big Bang Theory today, the perfect show for her since she went back to college to receive a Ph.D in neuroscience from UCLA after Blossom – wow! But I really appreciate that she never went all celebrity and seems very down to earth. There’s a great article on her in this month’s VegNews about her vegan transition and raising her kids vegan with great insights on the lifestyle and handling criticism, worth the read if you get a chance. For dinner, I broke out one of my favorite ingredients that I would have never known even existed before going vegan – hemp seeds. 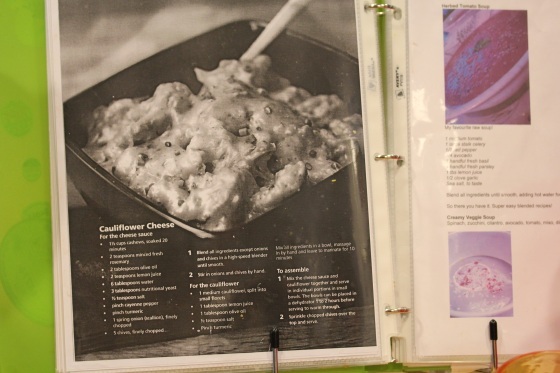 To modify a great Cauliflower Cheese recipe I saved from an old Get Fresh! issue. The problem with the original recipe to me, while very good, was it contained too much pureed cashew cream and was a little too rich. 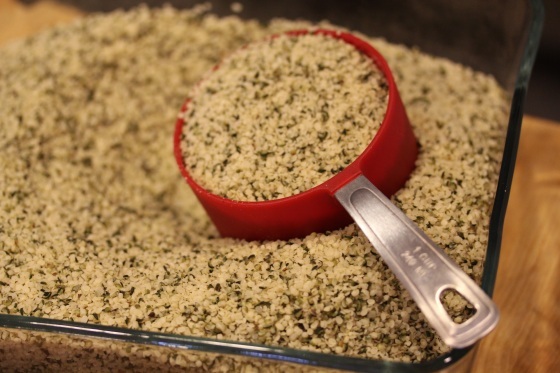 I rebooted it with hemp seeds for more complete protein, more nooch and more spice. 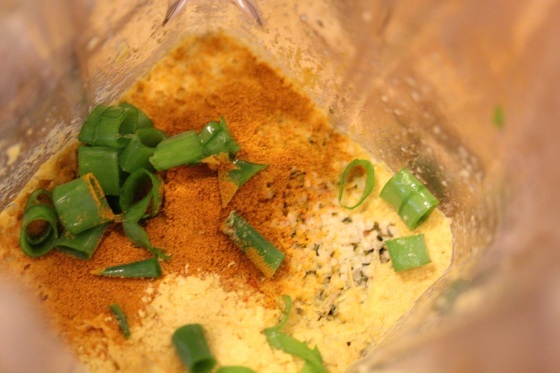 Place all ingredients in a high-speed blender and blend to a smooth and creamy texture. Great for salad dressing, creamy raw veggie dishes or even a dip or wrap spread. Makes enough for a 4 serving dish. The texture of the sauce is very thick and creamy, much like a dairy-based cheese sauce. 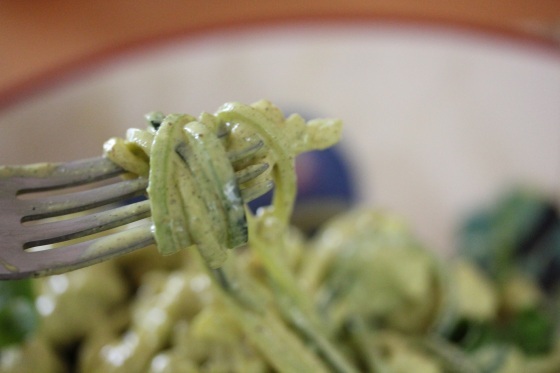 For a little fun, I broke out the spiralizer to serve raw zucchini noodles with the sauce. And I chopped up a head of cauliflower. 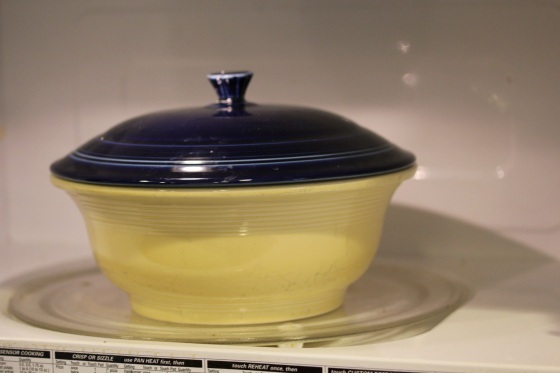 Since raw cauliflower can be very tough on my stomach, I steamed it in the microwave for 3 minutes to soften it up and make a little easier to digest. Then I set it aside to cool while I prepped the rest of the dish. I poured the sauce over the cauliflower and zucchini noodles and mixed until all the veggies were covered with the gooey goodness. Then I just served it topped with fresh chopped green onions. The texture is very smooth and the flavor rich and savory with a strong rosemary taste and smell with a slight spicy kick from the cayenne and turmeric. The texture of the slightly steamed cauliflower was perfect, not overly crunchy. 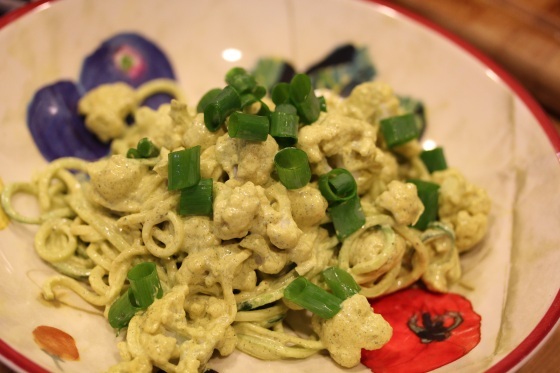 And the thick sauce coated the zucchini noodles perfectly making them delicious and might be a hit with kids for the creamy cheesy pasta taste. Best of all is the sauce comes together quickly, this dish was ready in 15 minutes. As if composting wasn’t enough, I’ve found another way to not waste veggies. 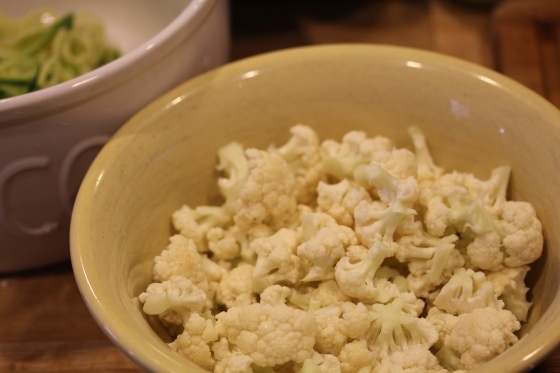 Cauliflower stalks are also a great source of nutrients and fiber, but like pineapple cores and broccoli stalks, impossible to eat raw. I have a scrap container I keep in my fridge of raw edible veggie scraps that I otherwise wouldn’t eat. I add the scraps to my breakfast smoothies and hardly notice they’re there with the fruit and Sun Warrior protein powder blended in. It’s a great way to get more out of veggies, especially when they’re pricier organics. I’m always so impressed by your meals! That looks so delicious. I only have hemp protein + fibre powder – it’s 100% hemp but looks like coarse dark green dirt – none of the cream coloured bits in your hemp – I wonder if it would work in this recipe? I suspect not. Thanks! :-) The hemp protein powder won’t work because it’s just the protein and fiber separated from hemp seeds. 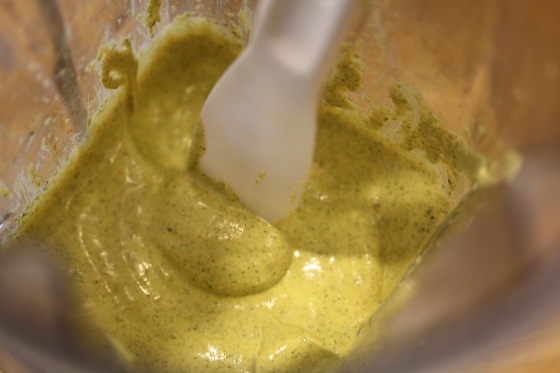 It’s great for smoothies, but lacks the healthy fats to make the sauce rich and creamy. I’ve tried using hemp protein powder in raw soups before and the flavor just wasn’t the same as using whole hemp seeds. Raw cauliflower is MURDER on my stomach. And a few other raw veggies. My pup Sienna wants to raid your compost! She loves raw cauliflower and broccoli stalks. I loved the article about Mayim. Happy to see more celebs going vegan. Hmmm, I need to see if my dog would like raw stalks. Because she has such a tiny mouth, she’s not a chewer and won’t go near dry dog food, so I’d probably need to throw them in a food processor first. I love that you dont waste an ounce of your produce and have a to-be-blended container. I pretty much do the same….I use the last of anything in my veggies bakes w/ nooch. It’s a great way to use stalks, stems, etc that no one would eat raw. over zuke noods AND the steamed cauli (yes if i eat raw cauli my tummy will REBEL…I actually like the taste raw soooo much, but it’s super hard on my digestion) but yeah the whole meal looks fabulous! and your pic CLARITY is getting so good. The vibrancy/clarity is great! I love that the Vita-Mix can puree the stalks to perfect smoothness in smoothies, raw cauliflower does not bother me in that form. Great creamy recipe! Can’t wait to try it! 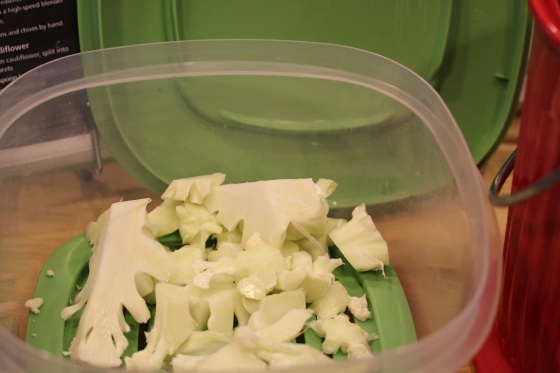 And really love your idea on how to use vegetable scraps. I learn so much from you, Christine! Thank you! Ha, I LOVED me some Blossom when I was little. I was pretty partial to Six’s style…loved her hats. 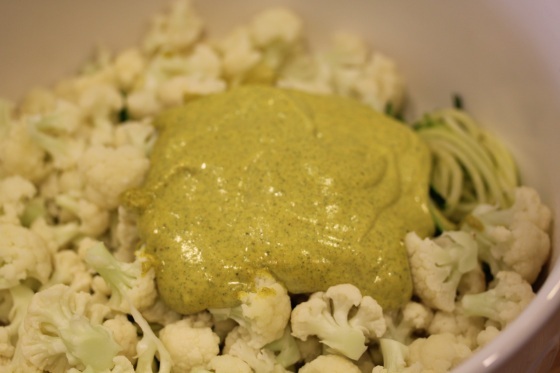 Wow, this recipe, thezucchini, the cauliflower, this has my name all over it!! I’ve never tried hemp seeds, but anything creamy with nooch is bound to be good! Oh, and I read that VegNews article too! Loved it, and I am not vegan or a mother. Ummmm, yes please! 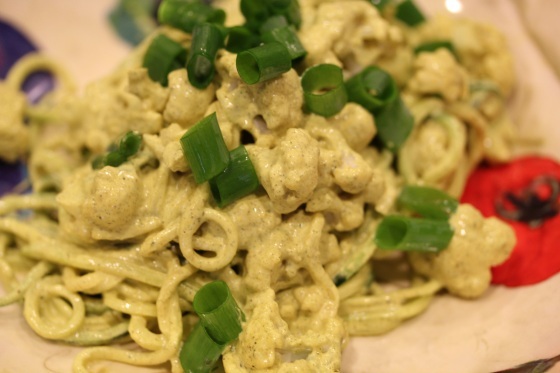 This looks so creamy, comforting, and HEALTHY! Love it. I made this sauce (omitted the green onion because I didn’t have any) and it was very good, I don’t typically like nutritional yeast so I halved the amount in your recipe and it was perfect for me. Thanks. 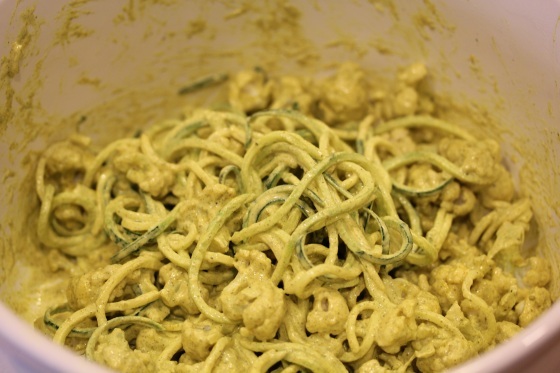 I have yet to get a spiralizer, even though I’m gaga over the idea of zucchini noodles. Where did you get yours from? And am very happy with it, pretty easy to clean, great for cucumber, zucchini, yellow squash, butternut squash and larger carrots. It’s also fun to run a raw sweet potato through and bake the noodles for thin, curly fries.